3 hours surfing lessons for Beginner Surfers. 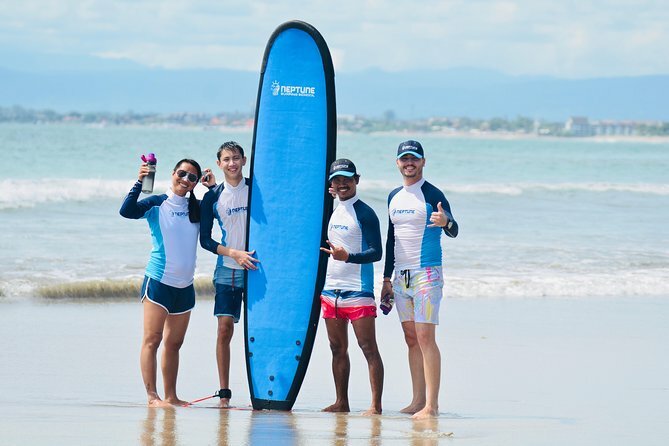 Learn the skills and capture the gentle Bali waves in Kuta, Seminyak or Jimbaran. Guided by certified surfing instructors, join the beginner groups to make the first step into the sport of surf. The day begins with the hotel transfer and a meet and greet coffee time at our amazing surf school in Kuta. With smiles and positive energy we will begin the class-room briefings and proceed with gentle steps to our surfing location where a secondary briefing will be held before jumping in the water. We will be spending approximately 3-4 hours for the entire course starting from the moment we meet each other until the lessons end in the water and we come back to the surf school for a refreshing shower and after surf drinks and snacks. In the water we are generally spending approximately 45-60 minutes following a break on the beach before going back in the water for the second session of surfing. Hotel transfer details are confirmed the evening before the surfing date as our schedules are finished. However, the best location for Beginner Surfing Lessons in Bali are by far Kuta, Seminyak or Jimbaran. Timing is always flexible as it can change depending on weather conditions or tide charts. Our certified surfing instructor alongside our operations and logistics continuously monitor weather forecasts to make the best decisions for the schedule which we will inform to you as soon as we know. Surfing is a dynamic sport which depends exclusively on weather, tides, winds etc. Starting times can change on last minute circumstances and such changes will be communicated accordingly. Generally all logistical details are provided in the evening before the activity date and they rarely change. It is safe to expect changes however in case of bad weather conditions.